Racing started at Syston in 1906 with a hill climb. 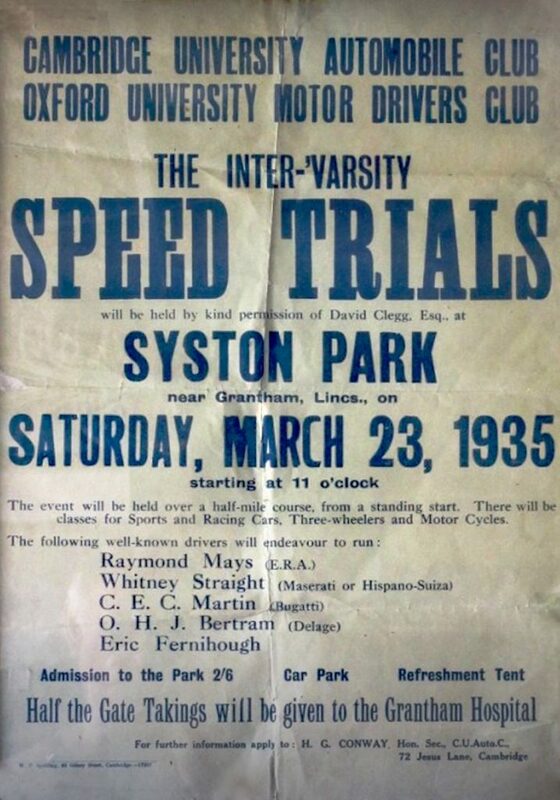 In 1926 Syston Park created the ﬁrst road race circuit in Britain. With Brooklands and Donnington Park it became one of the premier racing venues of its time attracting crowds of 30,000, however racing ceased in 1939. Originally a motor cycle Grand Prix venue Syston Park was used as a training ground for the TT and Manx Grand Prix. Later in its short history it attracted cars such as ‘Bloody Mary’ and ERA R1 competing in the Oxford & Cambridge Inter ‘Varsity competitions. However we might find time for a special Syston Park party on the day for all those involved with a bbq, bar and motors! Anyone who has purchased tickets for 2018 will receive a full refund and we will keep everyone updated…so watch this space!